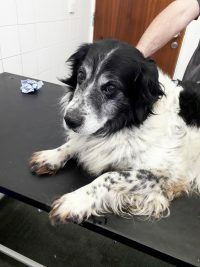 This old boy was surrendered into the care of Waterford SPCA recently. He is now making a great recovery and is very happy mixing with the other dogs in the shelter. Rex is similar to many dogs taken into our care – taken from situations where their care and social needs are not being met. Thanks to calls from the public and to our wonderful welfare officer we can make a difference to the lives of many dogs like Rex.